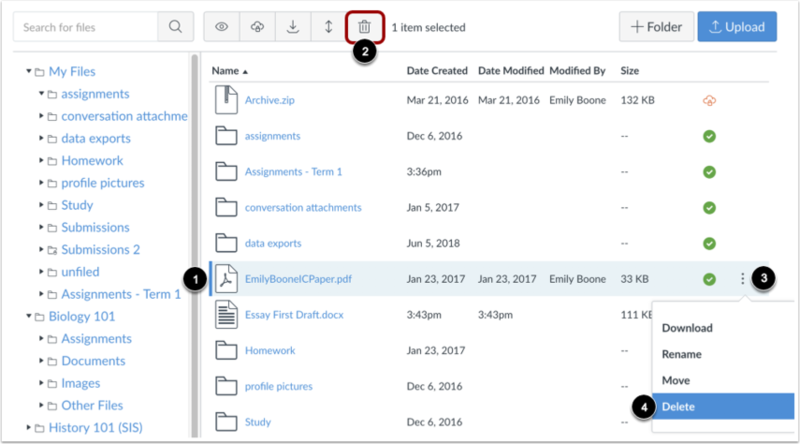 You can delete a file or folder within your personal or group file storage area. Once a file or folder is deleted, it cannot be recovered. Note: Files that have been submitted as part of an assignment cannot be deleted. In user or group files, click the line item for the file . Click the Delete icon . Or click the Options icon  and then click the Delete link . In user or group files, click the line item for the folder . Click the Delete icon . Or click the Options icon  and then click the Delete link . Files that have been submitted as part of an assignment cannot be deleted. Previous Topic:How do I upload ZIP files as a student? Next Topic:How do I download a single file as a student? Table of Contents > Files > How do I delete a file or folder as a student? Re: How do I delete old assignments from Canvas? Re: e portfolio - how to delete files uploaded?